Sports Rendezvous: Super Eagles: 2018 World Cup players fly out to Russia in green-and-white themed native attires. Super Eagles: 2018 World Cup players fly out to Russia in green-and-white themed native attires. Photos have emerged of the players in custom-made native attires designed in the national Green and White colours. 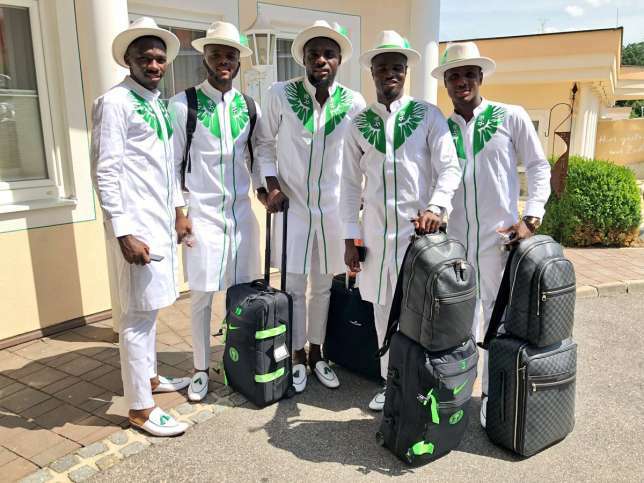 The Super Eagles of Nigeria have jetted out of Austria to Russia, all donned in specially designed green-and-white-themed native attires. After more than a week at the Avita Resort in Bad Tatzmannsdorf, Austria, the Super Eagles on Monday, June 11 jetted out to the Russian city of Yessentuki, they base for the 2018 FIFA World Cup. Photos of the players in the custom-made native attires designed in the national Green and White colours emerged on social media just before take-off. There is the logo of the Nigeria Football Federation (NFF) on the chest region of the native attire. The players complimented their look with white bowler hats and white shoes, both with touches of green. It is not yet known who designed the attires.